Voted "Best Fried Chicken" in Bay County 5 years in a row. The kids will love it here, and we know you will too! Join us every Thursday from open to close for Pint Day! Get a free souvenir pint glass with every draft beer purchase (limit 1 per customer). The Wicked Wheel, Family Friendly, Voted Best of Bay! 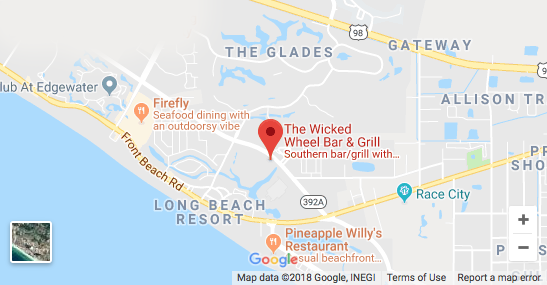 The Wicked Wheel Bar and Grill is home of the Emerald Coast’s Wicked Good Fried Chicken – voted Best of Bay – marinated, hand battered and deep fried in cottonseed oil. Try our New Orleans Style Thin-Cut Catfish which is sure to have you coming back for more, and our delicious All-Natural 1/2 lb. Angus Burgers are a favorite with the locals. Put some South in Your Mouth with our southern sides, including beans & rice, collard greens, cheese grits & more! The kids will love it here, and we know you will too! We're giving away a pretty amazing Mother's Day gift to one lucky winner! Follow the directions on this flyer and start getting your name in the box!